the old SWITCH, you can take the new ROUTE and TSHOOT and become a CCNP. All the valid combinations are available through a comparison tool from Cisco. one of the new ones to round off the CCNP. Good luck to all the CCNP candidates out there! The last day to take the old exams will be January 29, 2015.
a weighting included, which shows how much weight each section holds of the entire exam. see what has been added or clarified from the old blueprint. important concepts that you will surely run into in a role as a network engineer. This is also not really new but Cisco now includes them in the blueprint. so it seems only the concepts should be known and not the configuration. This does make sense in a way because Frame Relay concepts are similar to MPLS, DMVPN etc. AS numbers and private AS, which is good for real life networks. very common in todays networks. GRE was already there, so that is not new. The topics of DMVPN and EVN has been added. much EVN so far but it’s still a concept you should at least have heard of. Most of the topics here should be familiar. NAT between IPv4 and IPv6 has been added. that IP SLA and NTP being included. Also, CCNP candidates must now know Netflow. is to be expected. Nothing major added here in my opinion. Not many addidions in this area, private VLANs and storm control is there. to secure the layer 2 part of the network. FHRP protocols that we still use. 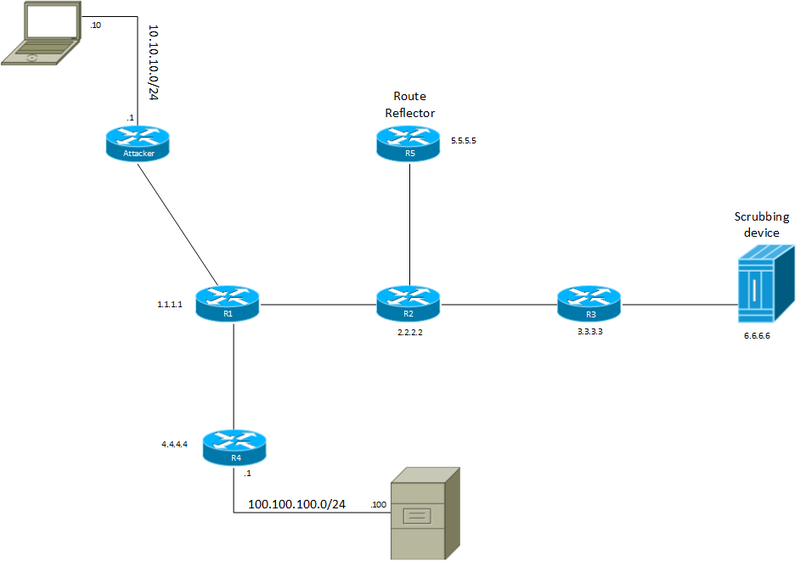 are getting moved to other CCNP tracks. The new blueprint is a lot more detailed than the old one. Nothing new here really, these are all tools expected to be known by a CCNP candidate. new but are specifically mentioned in the blueprint, which is a good clarification. GRE is still there, it’s worth 5% of the exam which is good to know. IPv6. The other topics seem quite straight forward. This section has some additions such as VTPv3, SNMPv3, NTP and IP SLA. so they are not major topics. at the blueprint and it seems it is just a revamped version. It’s not a major overhaul. candidate to build a study plan and study at the correct depth. There are some additions such as VRF lite which are good real world additions. In summary I think Cisco has done a good job of updating the CCNP curriculum. a video wall. 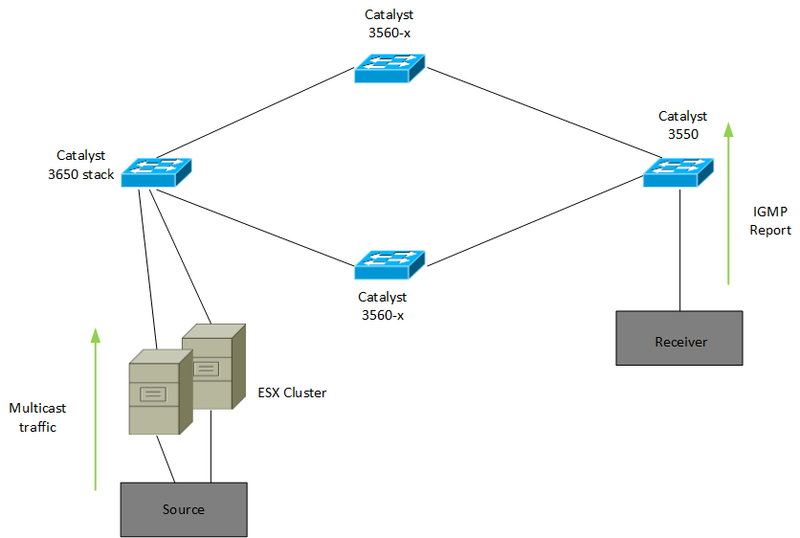 I had been told that the network has to support multicast. As all the devices were residing in the same VLAN, I did not expect any issues. 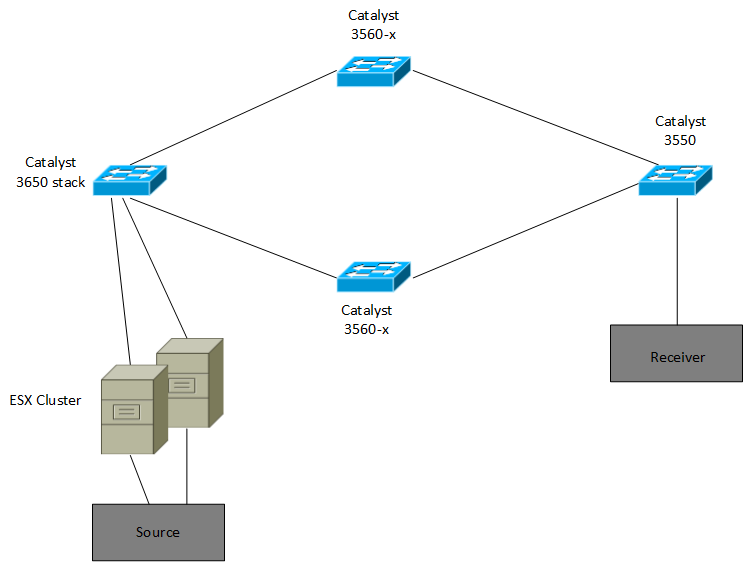 Before describing the issue, let’s think about how multicast at layer 2 works. if running multicast in the same VLAN between different switches. keeping the traffic from passing through the other switches to the receiver. for the multicast group. It does not however forward the IGMP report. group in its snooping table. The traffic is essentially black holed. must be relayed, it’s enough that the switch learns that there are receivers out there. In my case I configured the 3650 stack to be an IGMP querier. After turning on the IGMP querier feature, the issue was solved. switched environment. There is an excellent post about it here from Cisco. peer iBGP from their loopbacks to the RR, including the scrubbing device. The scrubbing device does it job, sends the traffic towards R3 and BAM! Traffic is looped… Why? R3 has a route to 100.100.100.100/32 pointing at 6.6.6.6. When the scrubbing device sends the traffic to R3 it gets looped back. and to keep the traffic from looping? is facing the scrubbing device with an ACL for traffic that needs special treatment. then be connected to R2. 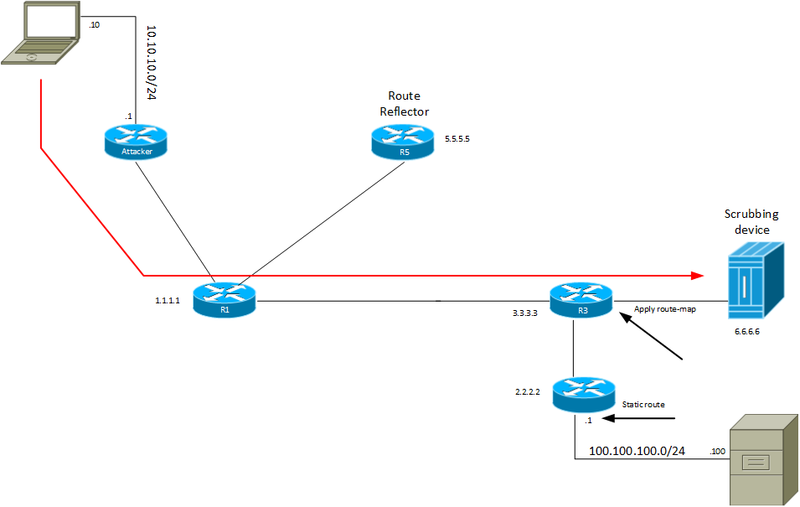 R2 would need a static route to override the BGP /32 route. unsupported actions in the route-map. The traffic would then be tunneled from the scrubbing device to the attaching router. Because R4 has a /32 route in BGP, a static route should be added to overcome this. supports GRE tunneling and a payload of at least 1460 bytes. There is also the possibility of reinjecting the traffic into another VRF. MPLS would be needed to support this solution. an infrastructure supporting the use of VRFs. and how we sometimes must overcome the normal forwarding rules of the network.